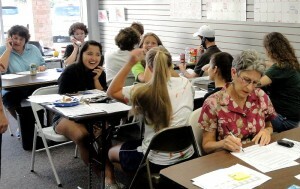 The Tea Party got their candidates all across Virginia in the August 23rd primary, and that inspired active phone banks and canvassing for Democrats in Fairfax County. This election year will determine whether the corporate-funded Tea Party takes over in Virginia and we need your help to make sure that doesn’t happen. The Virginia Tea Party already has their leader in US Congress Majority Leader Eric Cantor, and even a big earthquake in the middle of his district hasn’t stopped him from shooting down proposals to streamline Federal regulations or to protect Hedge Fund managers and corporate interests. In the recent debt ceiling battle, Eric Cantor led the Tea Party charge to protect the billionaires and corporate tax breaks and the result was they saved the billionaires while making severe cuts to the largest employer in the US (and Virginia), which is the Federal Government. Eric Cantor has been a plague on the middle class and working poor in Washington and we can not let the Tea Party make it even worse in Richmond this year. Most of the people in the Tea Party have been duped into supporting a cuase that is designed to protect billionaires and hand over our Democracy to corporate interests. These people should be protesting Koch Industries and the Republican Party because the original 1773 Boston Tea Party was a protest against unfair corporate tax cuts. The tea dumped in Boston harbor was not expensive, heavily taxed tea, it was cheap, cut-rate tea. The British East India Company had been given an unfair tax exemption and tax rebate by British Parliament. This would have established a trade monopoly in the colonies. The original Tea Party was a protest against unfair and extreme corporate influence in government. Koch Industries is the modern day version of the British East India Company but they funded and manipulated the new Tea Party movement to protect their outrageous corporate tax cuts, loopholes and ability to influence and control our government. They funded and organized the Tea Party rallies through Americans for Prosperity and FreedomWorks and they put Republicans on stage to lead the Tea Party supporters to the wrong side of their own movement. They attack public education and science (specifically global warming science) because it clouds the issue and keeps us from making any real progress on cutting fossil fuels and oil industry profits. Koch Industries is primarily involved in petroleum refineries, pipelines and petroleum based products like fertilizer, plastics, asphalt etc. As long as public schools teach science, it’s a threat to the oil industry and the Republican Party. Tea Party Republicans spread fear about illegal immigration because it scares people into voting against their own interests. But it was the Republicans who opened the flood gates with Mexico in the 1980’s to break the backs of Democratic labor unions and to provide cheap labor for large corporate farms, construction companies and manufacturing plants. Ronald Regan campaigned on the promise that “No law should be allowed if it results in crops rotting in the fields for lack of harvesters.” He followed through on that promise by re-classifying the Federal law “Entry Without Inspection – Title 8 USC 1325” from a misdemeanor to an administrative fault, which has no fine, arraignment or paper trail if you cross the US border without inspection. Undocumented workers are recruited, hired and trained on the other side of the border and the vast majority are shipped directly to their job in the US. They are trained how to avoid deportation and as long as they don’t violate other laws, like using false documentation or illegal drugs, it is very difficult to send them back if detained. They are also paid slave wages, have no healthcare, vacation or other benefits. It’s highly profitable for Republican-owned corporations like Koch Industries. It also keeps labor unions and the Democratic Party weak. In 2009, the Tea Party fought and badly mangled healthcare reform because lowering healthcare costs in the US would make it more difficult to export white collar jobs overseas and import cheap blue collar labor from Mexico and South America. Republican corporate interests make huge profits by driving wages down in the US, and that is why the gap between rich and poor has more than doubled since 1968 and is now the widest gap it’s ever been. The hypocrisy of Republicans causing the problems and then fear mongering to take advantage of them is standard operating procedure. Republicans rail about how bad government is and they ask you to vote for them so they can prove it. Remember the “Ground Zero Terror Mosque” story that FOX News focused on for 6 months leading up to the 2010 election? They pushed that story relentlessly to spread fear and scare people into voting against their own interests and this is how the Tea Party Congress took over in 2010. How did it go unnoticed that the person funding this “Terror Mosque” is the second largest stock holder in FOX News, Saudi Prince, Al-Waleed bin Talal? In fact, the parent company of FOX News is largely owned by Saudi investors and the role of FOX News is to keep us addicted to petroleum by helping get Republicans elected. Did you notice how the “Ground Zero Terror Mosque” story disappeared right after the 2010 election? Please don’t let 2011 be the year the Tea Party takes over Virginia and corporations completely take over our government. Please get out and volunteer this year. Get to a campaign office near you and make phone calls and knock on doors to make sure we get our voters out to vote on November 8th.